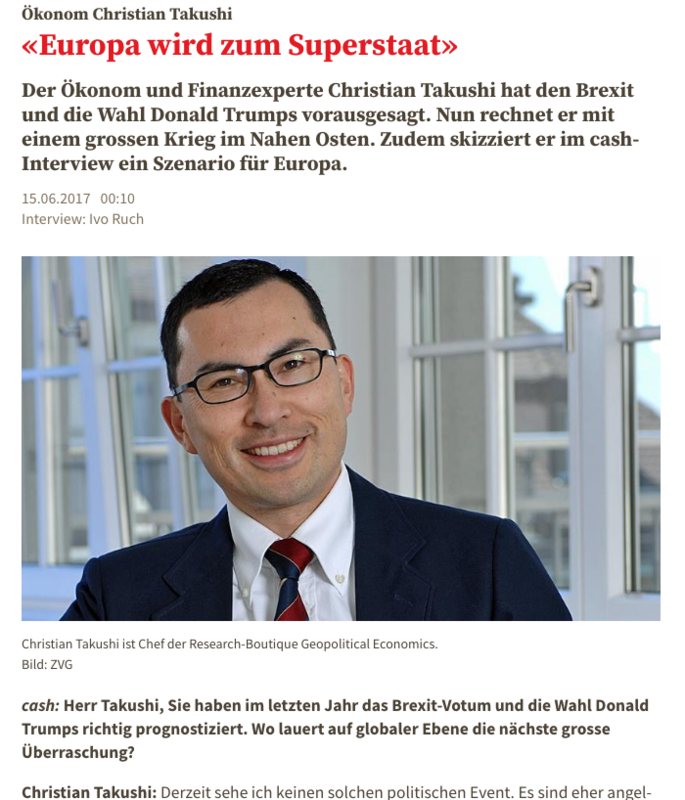 Cash Magazine Interview with Christian Takushi, June 15, 2017 – Translation from German into English by a writer in CA, USA. Cash: Mr. Takushi, you predicted the Brexit vote and the election of Donald Trumps last year. Where is the next big surprise on a global scale? Christian Takushi: At the moment, I do not see such a political event. They are more Anglo-Saxon countries, where so-called voter revolts are taking place. These will happen when the political establishment wants to influence the electorate. Countries such as Hong Kong and Singapore, or Chile and Peru, have been affected by liberal, American globalism. This is not the case in Western Europe. As I always say: Western Europe is not the USA. In Switzerland, too, we have witnessed political events in recent years which, contrary to the media consensus and the majority of the experts’ opinions, have had similar results. Is Switzerland a special case in Western Europe? Switzerland and Holland are the most Anglo-Saxon countries of Western Europe, along with Great Britain, of course. The Swiss tend to rebel against paternalism. This was seen in the EEA vote in 1992. Switzerland has a democracy that deserves its name. This is not the case in many European countries. Where does Switzerland stand in relation to Europe? Switzerland is also changing. After the Brexit and Trump shocks, many conservative forces are turning back to the camp of pro-Europeans. Many people say that cohesion is now necessary to defend the achievements of the liberals against the Anglo-Saxon bastion. This is also at the expense of the SVP (the conservative Swiss Peoples Party), as seen in the failed implementation of the mass immigration initiative. Europe still largely relies on immigration and free trade, which the USA no longer does. Which model leads to more prosperity in the long term? Both models can be successful. But every new model experiences a boom in the beginning and then is followed by a time of crisis. We have now experienced about 30 years of liberal politics in the world. But it failed to renew and improve itself (liberalism is in crisis). Phenomena such as mass migration and free trade brought problems. And gradually the disadvantages outweigh the advantages. Since the mid-1980s, world trade and economic growth (GDP) have been growing strongly. But wage growth is stagnating (in the developed world). The mass migration is putting downward pressure on wages. Who benefits from it? The large conglomerates and multinationals. They are growing in size and are increasingly influencing politics. The large conglomerates and the very wealthy pay less and less in taxes if any. The political problems and economic costs are carried largely by the middle class. What is the solution? The course the United States and Great Britain have taken? I think these alternatives (as taken by the USA and Britain) can also be successful. They will focus on migrants who contribute more to prosperity and are more likely to adapt. They will operate using a balanced free trade. But exaggerations and over-estimation can happen even in this system. In the US, however, Donald Trump has profited enormously from the capitalist excesses of recent decades. Isn’t this a contradiction? You’re right. Still, I see many good approaches in what Trump is doing. But he has already laid the foundations for future mistakes, too. He believes there is a ‘deal’ for every problem. This may prove arrogant. For example, in the Middle East, where all peace efforts have failed in the last 3,000 years, he wants to bring about a solution within the next four years. This puts pressure on Trump himself, Israel, as well as on the Palestinians. In 2017, multiple important historical events will be remembered in the Middle East. The Balfour Declaration, which was the basis for Israel’s rebirth, took place 100 years ago. And 500 years ago the Ottoman Empire took control of Jerusalem. The biggest geopolitical event, however, is the 50th anniversary of the Six Day War. This conflict has never ended, not for Israeli nor for the Arab side. The Muslim world lost Jerusalem to the Jews and Christians. What consequences could this have for a new conflict? In the East, people think more in historical and religious contexts (cyclically). The commemoration of this anniversaries has accelerated the struggle between Sunni and Shiite religious groups for power in the Muslim world. As soon as that is resolved, I reckon there may be an attack on Israel to restore the rule or influence over Jerusalem. From this historically-religiously charged year 2017 onwards, the Arab-Muslim states are trying to re-write history. The process should be completed before 2023, 100 years after the collapse of the Great Caliphate (another historical anniversary for Islam). What concrete facts can you show for such assumptions? Already in many countries of the Middle East, war preparations are taking place, which, unfortunately, are being accelerated by the Trump administration. Saudi Arabia receives $110 billion worth of weapons from the US. This is all in the name of peace. Already Obama’s US-Iran treaty has forced Saudi Arabia to upgrade their nuclear capabilites. So it soon may lead to an armed conflict? There is, in addition to the military option, a second one: how to force the world community to pressure Israel into a peace treaty? Whoever can do this becomes the leader in the Arab world. This is what Iran, Turkey, and Saudi Arabia want, along with Egypt. In the same way, the big global powers want to have their say (on Jerusalem). Israel and Palestine may thus become puppets for the whole world. There is likely to be a conflict between 2017 and 2024. And I cannot rule out the possibility of a world war involving the USA and Russia. My current likely scenario is this. Hezbollah attacks Israel. Iran joins forces with Hezbollah. And Russia steps in to support Iran. And the US will side with Israel. This should also have economic consequences. What do you expect? The volatility in the financial markets will increase markedly after nine years of artificial decline. Trade routes will be blocked, and raw material (along with energy) and food prices will rise. What other factors will threaten the global economy in the future? In many countries, we are witnessing a return to nationalism. In many places around the globe there an arms race is underway: South Asia, Pakistan, throughout the Far East. Many experts don’t have them (seriously) on their radar screen. Even extreme natural events will become an increasing threat. Instead of the USA, China is advancing as the champion of the liberal world. Will China soon become the most important player in the global economy? The Germany-China axis is currently very strong. This also explains why the US is somewhat more reserved towards Berlin. China will continue to shift into the center of the global economy. But I think that China will not be able to overtake the US economically and militarily. The biggest problems in China are the credit bubble and the demographic implosion. An increasing number of old population converges with a shrinking pool of working age people The Chinese leadership deserves praise, but there is also a lot of marketing behind it. China portrays itself as a champion and model student, but also is, for example, the world’s largest polluter. Let’s look at Europe. Italy and Greece once again are making headlines. Will the euro survive? Yes, albeit in modified form. The EU and the euro are a means to an end for Germany. We will experience even more power concentration in Europe in the future, as Europe becomes a super-state. Should the EU break up, a new federation will be created with a greater concentration of power. At the same time, the national states will disappear. Other super-states are a possiblity in North and South America, in Asia, or in the Middle East. You were formerly active in the investment industry. How are investors currently positioned? Something is particularly important: many of the dangers we have addressed concern the northern hemisphere particularly. However, that is exactly where most investors are invested (with most of their assets). That makes regional diversification especially important. Many analysts recommend buying European stocks. Do you agree? Europe is the most vulnerable continent. European shares are indeed cheap, but Europe has not done its homework. The boom will not endure. Despite considerable geopolitical risks, equity markets have reached new highs in recent years. What is the influence of geopolitics on the financial markets? In recent years, the markets have been heavily influenced by politics and central banks. The volatility and, in part, the asset prices and interest rates no longer reflect the world reality. In addition, many investment funds are shifting from active to passive financial products (creating massive money flows that smooth volatilities). Also, in the recent past, we had only mini-crises on a geopolitical landscape. But the probability of a conflict between nuclear powers is now increasing. The shock to the financial markets could be enormous. Final question: Trump is currently under constant criticism. Will he complete the full term of office? I am guessing he will. I also reckon that the Republicans will win the next presidential election. The reason is the behavior of the Democrats. Their leading minds are gradually losing their decency and manners. Instead of letting Trump simmer as a kind of lame duck President, they are inventing new scandals every few days. Something that is kept out of the limelight for viewers in Europe (while in the USA this may eventually become something the public will almost ignore). It might be that Vice President Mike Pence will succeed Trump in the next four years (or over the next four years). Or, perhaps, one of Trump’s children. Christian Takushi (51) was a portfolio manager at Bank Leu (Credit Suisse Group) and Swisscanto Asset Management, before he became an independent economic adviser with expertise in Asia and Geopolitics. Among his clients are institutional investors, family offices and hedge funds. Takushi studied Macro Economics at Zurich University.